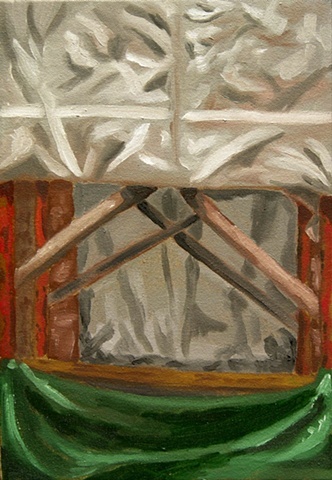 "Criss Cross" is a new direction in my plein aire painting practice which is touching on abstraction in the composition. As always, I go out with multiple canvases to a sight and usually will create a few paintings while out painting. "Criss Cross" is a focused composition from a larger scene. The almost even division of the space creates a disorienting context for the work with the poles leading your eyes back and forth in this composition. I feel that this new work will lead me into some new areas which I am looking forward to exploring.